Thrips numbers on our traps increased significantly last week. Counts were as high as I have seen in Georgia in four years. Growers need to be checking their fields for thrips injury especially if no insecticide was used at plant or if a neonicotinoid insecticide was used in-furrow. Thrips injury can progress quickly, and too often I see foliar sprays going out too late. 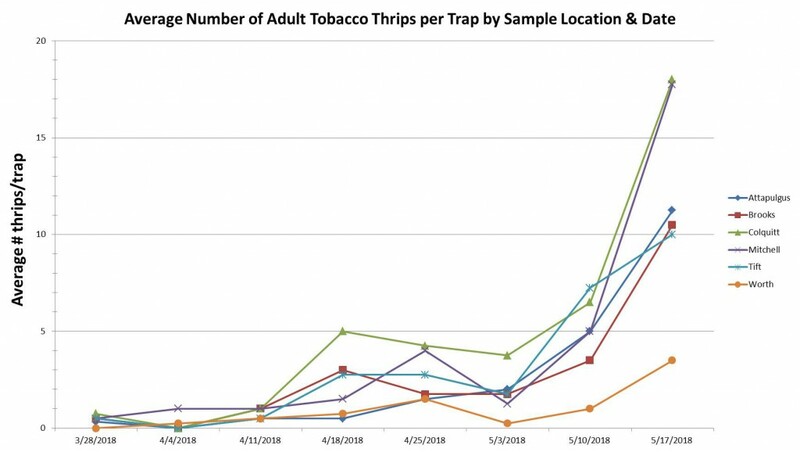 The model developed by NC State for predicting thrips dispersal indicates that thrips movement should be declining over the next couple weeks (at least in the Tift County area). Our traps are located mostly south and west of Tifton, and I have not heard anything about thrips activity in east Georgia. I will be making a trip that way this week. If foliar sprays are needed, acephate will be the choice of most growers. Note that the label for rates for acephate on peanut are much higher than the rate for cotton. These data are being provided for informational purposes only and may not be representative of thrips dispersal at your location. Peanut fields should be scouted regularly to quantify actual thrips populations. If you have questions about thrips or thrips management please contact your local county Extension agent. Posted in Thrips. Bookmark the permalink.